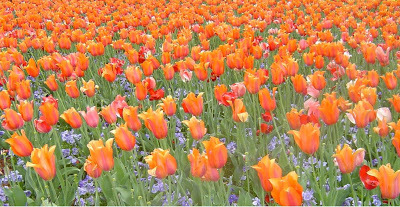 How does the thought of walking among 100,000 tulips sound? How about enjoying live music surrounded by hundreds of vibrant plants and colorful blooms in a glassed-roof conservatory? Or taking a tour of a winery and then sampling a special wine made especially for Spring? Look for the fleur de lis in pattern flower beds, urns and containers. It symbolizes the iris, the 25th anniversary flower. Musicians will add their sounds to Spring with daily performances inside Biltmore House in the Winter Garden (11am-3pm) as well as in the Conservatory (11:30am-3:30pm). In the Walled Garden, gardening enthusiasts will have the opportunity to learn from Biltmore’s horticulture professionals at the “Ask a Gardener” station from 11am to 4pm. Three free seminars will take place daily at A Gardener’s Place adjacent to the Conservatory: How to create five-minute floral arrangement masterpieces (1pm), wreaths for your door (2pm), and the basics of growing roses (3pm). The restaurants at Biltmore will have special menus. There are several dining choices on the Estate from which to choose: www.biltmore.com/visit/dining/default.asp. Antler Hill Village is Biltmore’s new village that includes the existing Winery and Farm (with its Kitchen Garden, farm equipment on display and farm demonstrations), plus the addition of a tavern, historical exhibits and the Outdoor Adventure Center, where you can schedule Segway tours, horseback riding, carriage rides, float trips, fishing, bike rentals and more. You can also listen to live music on the Village Green from 2pm-6pm. The Biltmore Winery celebrates its 25th anniversary this year, so the Conservatory will connect the Winery and Festival of Flowers anniversaries with colorful container plantings designed to represent wine selections, including Burgundy, Cabernet, Sparkling, Blush and Reisling, and decorative features such as corks, wine crates and barrels. The Winery will offer special Festival of Flowers wines in celebration, plus the Winery, a former dairy, has a new tour entrance in Antler Hill Village via the dairy’s original underground tunnel. Biltmore has new beer! Cedric’s, a new tavern in Antler Hill Village, and Biltmore is introducing a brown ale and pale ale in celebration, using standards of traditional English style that George Vanderbilt loved. And don’t forget to pick up discounted tickets when you stay with us: starting March 19, tickets purchased at the Inn on Mill Creek are $50/person ($10 off the daytime gated admission price) and are good for a free second day, so you can enjoy all the Festival of Flowers activities at a leisurely pace while you’re visiting our neck of the woods. This entry was posted in Uncategorized and tagged Biltmore, festivals and special events, Spring by Inn on Mill Creek. Bookmark the permalink.